nebula is probably one of the most famous deep sky objects in the sky. This bubble of gas is about 2300 light years away and therefore is itself more than 1 light year in diameter. 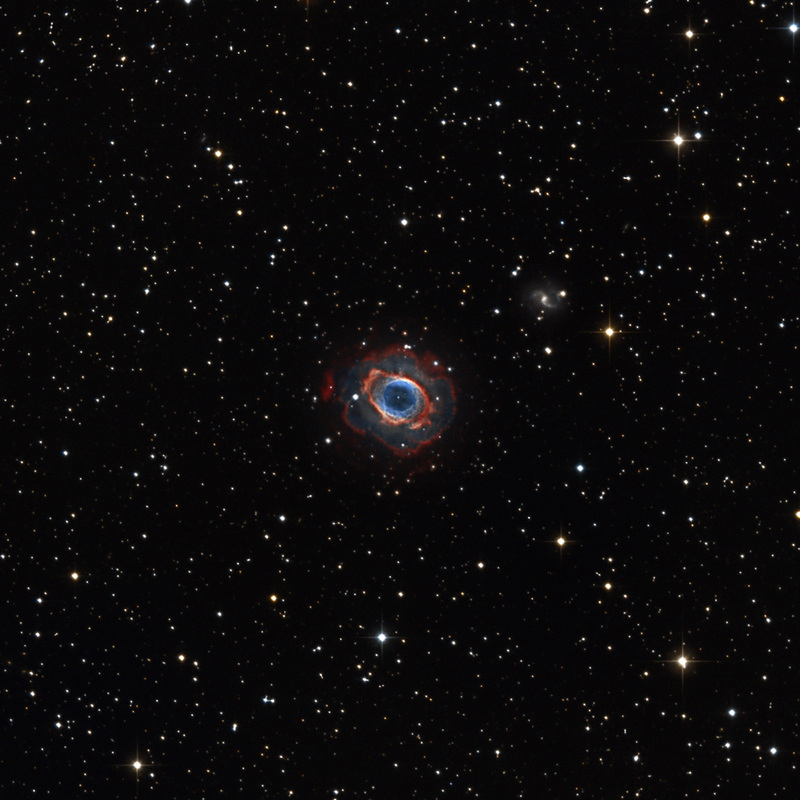 M57 is an example of the class of planetary nebulae known as bipolar nebulae, whose thick equatorial rings visibly extend the structure through its main axis of symmetry. It appears to be a prolate spheroid with strong concentrations of material along its equator. From Earth, the symmetrical axis is viewed at about 30°. The white dwarf (central star) is extremely hot (100000K) and emits UV radiation. This emission excites various gases in the bubble and makes them glow. The deep observations also show an extended halo of material extending off to over 3.5 arc minutes. Photographs taken over a period of 50 years show the rate of nebula expansion is roughly 1 arcsecond per century, which corresponds to spectroscopic observations as 20–30 km s-1. 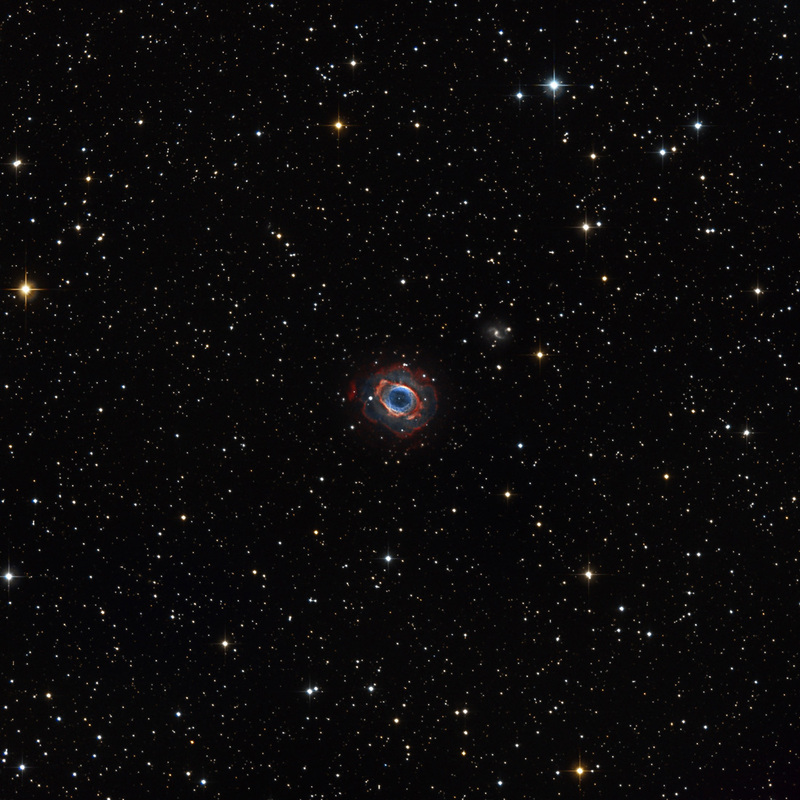 M57 is illuminated by a central white dwarf or planetary nebula nucleus (PNN) of 15.75v visual magnitude, whose mass is approximately 1.2 solar masses. All the interior parts of this nebula have a blue-green tinge that is caused by the doubly ionized oxygen emission lines at 495.7 and 500.7 nm. These observed so-called "forbidden lines" occur only in conditions of very low density containing a few atoms per cubic centimeter. In the outer region of the ring, part of the reddish hue is caused by hydrogen emission at 656.3 nm.The type SBb barred spiral galaxy IC1296 that lies in line of sight 4' to the northwest of the planetary nebula M57. It is a low surface brightness galaxy and is much farther away - an estimated distance of 221-million light years.